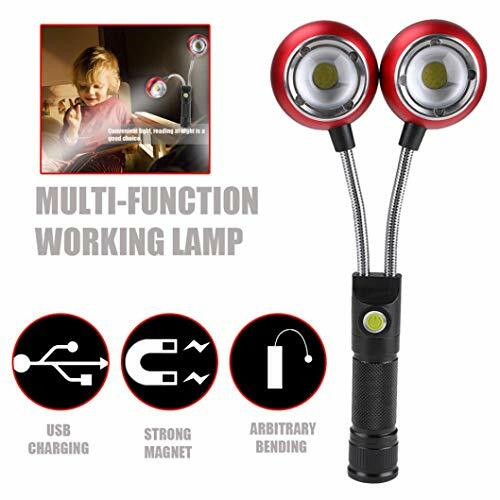 Black, LED Working Light, Ikevan Multifunction Portable COB Lamp Work Light Lamp Flashlight Torch Magnetic Hot by Ikevan_Work Lights at Wakaf Center. Hurry! Limited time offer. Offer valid only while supplies last. Feature: For picking up metal parts, hardware tools, nuts and bolts, etc. 1 C0B+2LED super bright LED Light, bulbs last more than 100,000 + hours. For picking up metal parts, hardware tools, nuts and bolts, etc. 1 C0B+2LED super bright LED Light, bulbs last more than 100,000 + hours. 360° rotatable swivel hook to hang your light anywhere you wish. 135°magnets on the base and magnets on top allow you to stick it to any metallic surface. PVC shell, waterproof, light weight. 2 Model light,high light and low light, you can adjust according to your needs. Built-in rechargeable battery, USB charging interface, easy to use. The construction of this little lamp also makes it very handy for working in tight and dark places, like under your sink or in the engine compartment of your vehicle, and the light is bright enough to illuminate a large area without having to hold a flashlight. This light is super bright. It's not blinding like a flashlight because the beam is dispersed (which is called "spill" in the flashlight world) much more than a flashlight, so it makes a good work light. Lightweight, Compact, Well-Built, Durable and Made From High Quality Materials. If you have any questions about this product by Ikevan_Work Lights, contact us by completing and submitting the form below. If you are looking for a specif part number, please include it with your message.